In case it isn’t obvious… I love lemons. Ending a dish with a squeeze of lemon or a bit of zest, to me, makes the whole world seem just bit brighter. And now I’m revealing my newest lemon-y obsession… lemon thyme. I have a bunch of it growing in my garden, and it just smells so amazing. Sweet, bright, fragrant… move over basil. (Ok, not really). My first thought was that this lemon thyme needs to be in a cake. But I’m not exactly Jeanine the baker, so my second thought was to make a bright summery salad with lots of lemon zest to bring out the herby flavor even more. So here you have a lemon thyme vinaigrette that I poured over a warm salad of orzo, arugula, and bits of creamy fresh mozzarella. I added some sun-dried tomatoes for tang and toasted chopped walnuts for a nice crunch. A perfect (easy) Monday meal that’ll make you forget that it’s Monday. Pair this with a nice bottle of prosecco (or a cheap one, no judgement), and you’ll really forget that the week has only just started. Cook the orzo in boiling salted water for about 7-10 minutes, or until al dente. Make the lemon thyme vinaigrette: Whisk together the olive oil, garlic, vinegar, lemon zest, lemon thyme, and pinches of salt, black pepper, and red pepper flakes. Taste and adjust seasonings. Place the arugula in a large bowl. When the orzo is done, use a slotted spoon to scoop the hot orzo over the arugula. Some of the pasta water will come over, that’s ok. If you don’t have a slotted spoon with small enough holes, drain your pasta and reserve some of the pasta water to add in. Add the mozzarella and pour in some of the dressing. Toss to combine, and the arugula will begin to wilt from the heat of the pasta. Add as much or as little of the dressing as you like. Taste and adjust seasonings. Top with the reserved lemon thyme, lemon zest, sun-dried tomatoes, walnuts, and a squeeze of lemon. Serve warm or at room temperature with grated parmesan cheese, if desired. I love lemon thyme! It does work really well in a cake, you’re right but I love this savoury way of serving it. Love the brightness that citrus flavours can bring to pasta. 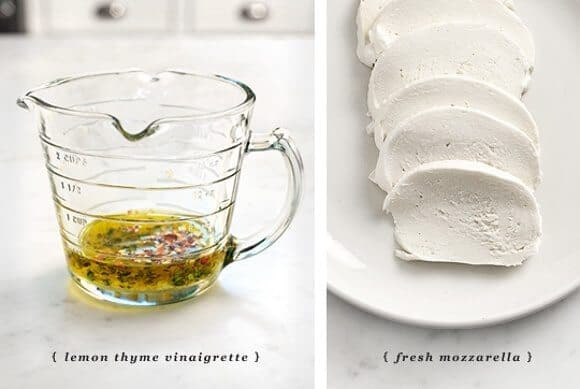 Mmmm, I could make a meal out of the fresh mozzarella and lemon thyme vinaigrette alone! This looks incredible. A perfect summer dish. good idea, maybe I’ll do a little simple caprese salad with the lemon thyme dressing next time! Such a beautiful salad! Absolutely fresh and delicious, I know! Lovely! I have a half-used bag of orzo I’ve loads of spinach in the fridge, so will definitely be making a spinach version soon, and I have absolute faith it will be fantastic! 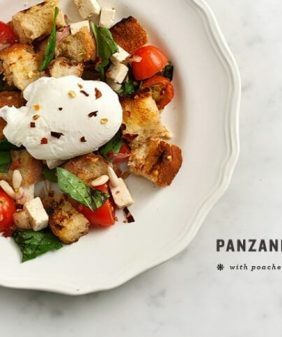 The thing I love about this salad (and what drives me nuts about most salads you get in a restaurant) is it doesn’t overdo what I call the “filler” elements (like pasta, lettuce, rice) – there seems to be great balance to this dish. 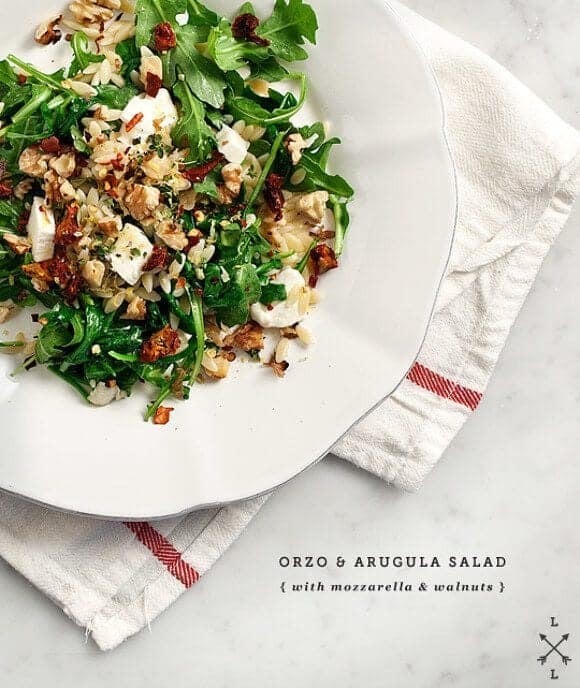 Arugula and orzo, yes please! Lemony vinaigrettes are my absolute favorite, I don’t think I’ll ever tire of them. 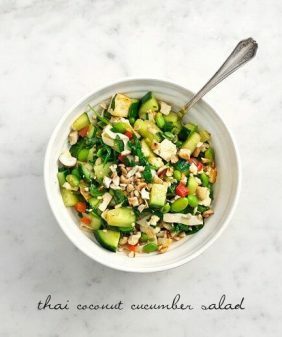 I cannot wait to try this salad! 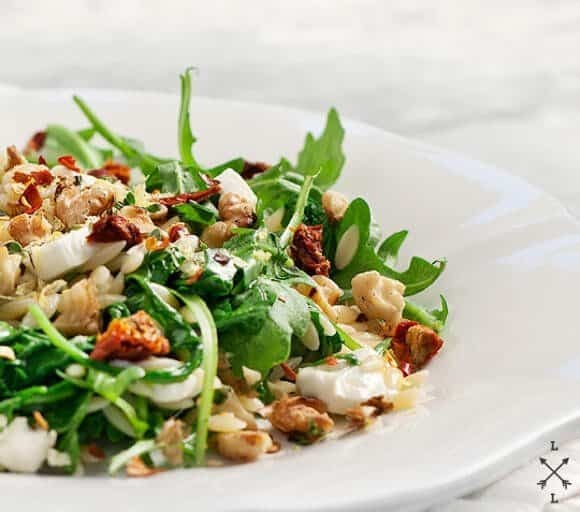 Perfect even for an Aussie winter with heartier ingredients like the walnuts, rocket and pasta. I just love this blog. Oh, this looks delicious! We have lemon thyme in our garden that we haven’t been using much. Thanks for the inspiration! Lemons are one of my favorite ingredients as well! Lemon thyme is lovely, and this looks like a salad I could eat everyday! Btw, the thyme would be incredible in a cake or shortbread! Love your photos so much–so very colorful and simple! I, too, love all things lemon. Looks like I just found inspiration for lunch today. I see you mentioned you added some sun-dried tomatoes, but I couldn’t find them in the recipe – did you use oil-packed or just dried? Hi Elizabeth, thanks for catching that – I just fixed it in the recipe. Mine were dried, but oil-packed would be just fine too. I love that your first thought was to put it in a cake! I bet that’d taste fabulous. Future post, perhaps? Meantime I am more than happy with this lemon-thyme salad! I am huge pasta fan with light lemon sauce and that plate has every thing I would love to eat! I adore lemon thyme too, and grow it as well, almost loving the lemon-ness of it over it’s regular counterpart. I recently made a blueberry lemon thyme compote and spilled it over a chunk of burrata cheese. It was heavenly. I may try this as well. I’m loving your blog these days. I really like the sound of this idea, thanks! Yes – lemon & thyme vinaigrettes are the best. And the fresh mozzarella is killing me right now, I want to eat it!! This was fantastic! Thanks for the great recipe! This looks delish! 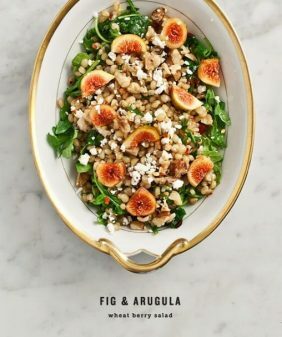 I’m on the hunt for ways to make a great arugula salad and this looks perfect. 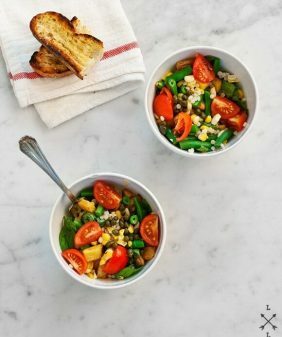 If I wanted to sub a whole grain for the orzo, what would you recommend? thanks! 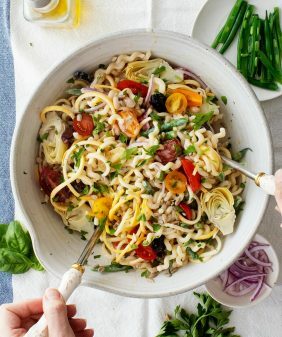 There’s a whole wheat orzo (I’ve seen it in the bulk bins at whole foods), a whole grain cous cous would work, farro (you’d have to cook it differently than the instructions here), or really any small pasta shape. (I like brown rice pastas, there’s also a quinoa pasta that’s in a small macaroni shape. Thanks for the suggestions! I’m trying to stick to actual whole grains as much as possible, over whole grain pasta. 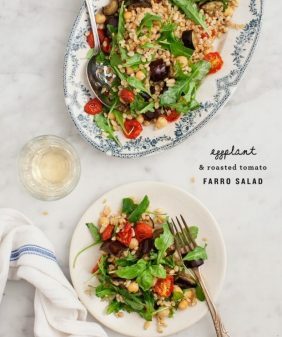 I’ll give farro a try. I don’t think I’ve ever had that. I was also thinking maybe Kamut?? Though I haven’t worked with that much either so I’m not sure what would be a good fit. I’m trying to branch out of brown rice, quinoa and my least favorite, millet. I know there are so many other whole grains out there – I need to expand my horizons!!! !